When I was young Mom had a wringer washing machine and dryers hadn't been invented yet. Everyone hung their clothes on a line to dry, and that line was normally inside. When it was overcast and the sky was full of clouds, it might mean rain was coming, but maybe not. I grew up, after all, in Los Angeles County in "sunny California." So when the clothes were ready to hang, Mom would look up at the cloudy sky, as her mother had before her. Then she would say, "I can hang out the clothes. 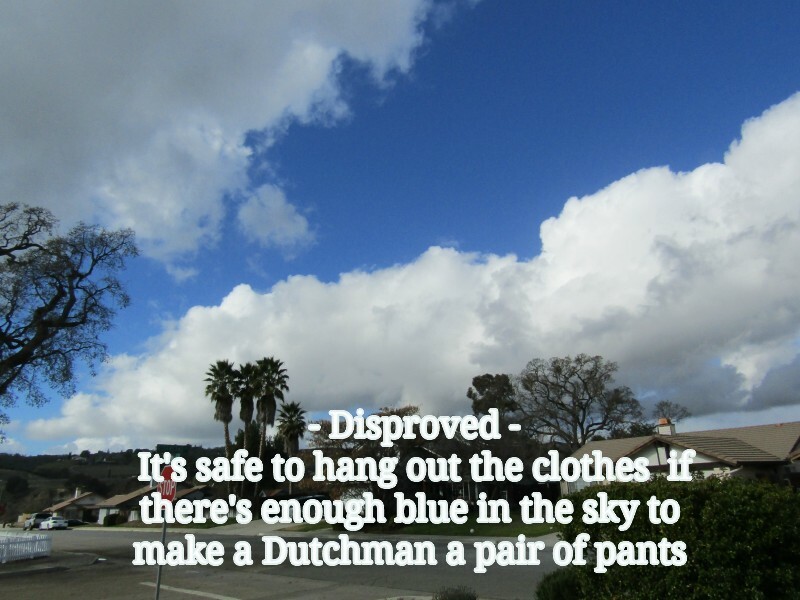 There's enough blue in the sky to make a Dutchman a pair of pants." Today I scientifically proved that's not true. 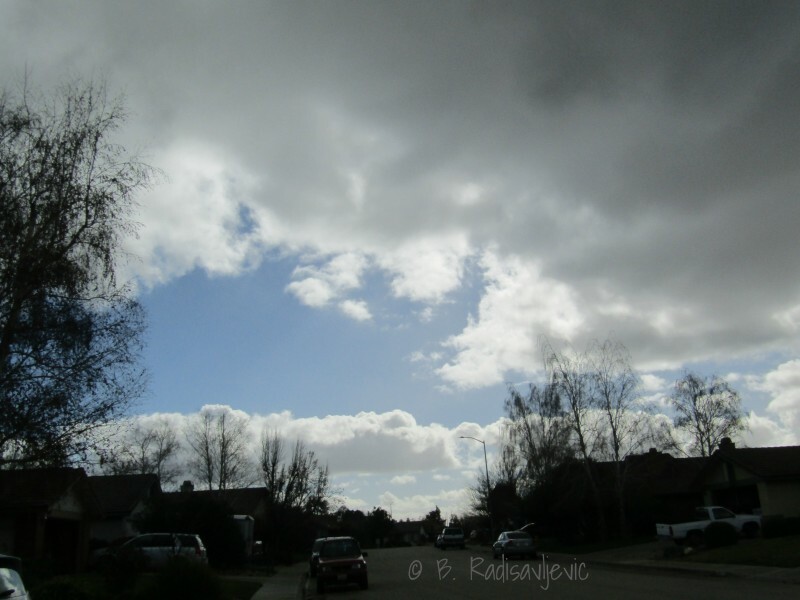 The photo above shows how the sky looked when I left to walk to my mailbox today. I didn't have any clothes to hang out, nor any line to hang them on. About halfway down the block, I stopped to take this photo. I'm sure glad I'd brought my camera bag. I'd brought it along to put my camera in when I had to use the key to open my mailbox. As it turned out, my camera might have been damaged without it. I took a few photos of the sky in different directions. About then I noticed that raindrops were falling on my head and all around me. It wasn't heavy rain, but I would not have wanted my clothes on the line. Now, an hour later, the sky is as blue as when I started my short walk.The blue had never left the sky at all. There is a slight breeze. There are still many clouds, but they are moving toward the northwest. The sun comes and goes. It will be down in three hours. If I had hung the laundry on the line, would it have dried today? I doubt it. But the sidewalk is dry again, at least for now. There's still a 5% chance of rain for the rest of the afternoon. The temperature has reached its high of 49 degrees. So, do you think if I'd had clothes to hang out when I left on my walk, they would have dried before dark? It was a project made necessary by my thrifty soul as my friend and hostess prepared to serve dinner on Christmas Eve. I saw her slice ham to put on the serving platter and noticed she was throwing any slice with a heel or too much fat or gristle straight into the trash. I asked her why she wasn't saving it for a soup. She said she didn't want to make soup. She offered to give me any more slices she didn't want, along with the bone. How could I refuse such a gift? Into a plastic bag it went, and it traveled between my cooler in the car and the refrigerators in our motel rooms, until we returned home from our three-day trip. Over the past two days, I made the soup. I put the ingredients together two days ago and let the soup simmer until most of the liquid fat had risen to the top. Then I cooled the whole crockpot overnight so the fat would congeal for easy removal with a spoon. I did that job yesterday. I also trimmed all remaining fat from the hambone and the meat slices so the soup would be as fat-free as possible. I sampled a small cup of soup last night. That taste made me very glad I had saved those ham scraps from the trashman and brought them home. The soup was worth the effort. Today and tomorrow we will enjoy having it to heat up. It will be perfect for the cold gloomy weather we have. It remains to be seen if we will get rain before the day is over. It's supposed to come at just the time I plan to be eating this soup tonight. We will also heat it up to enjoy as wait for 2017 to arrive. 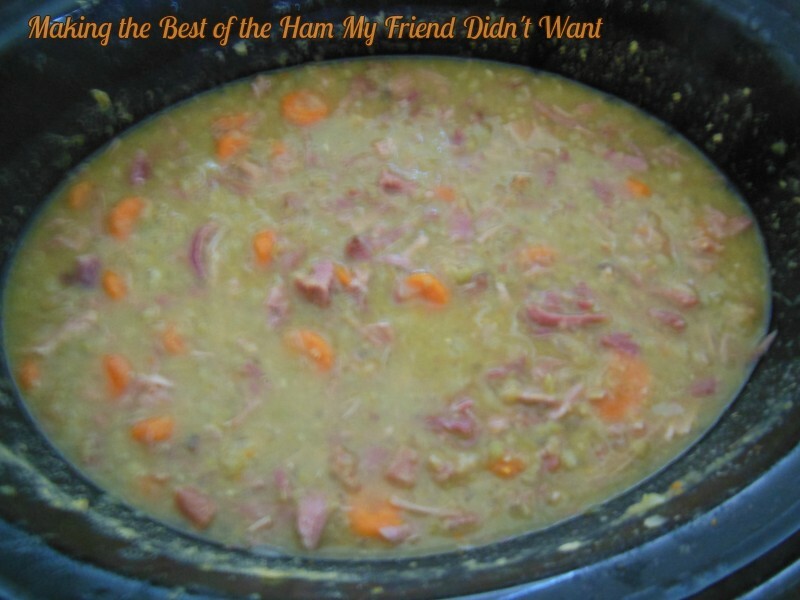 My crockpot makes the preparation of soup as easy as it can be. My food processor helped, too, since it made slicing the onions, celery, and garlic a snap. I love not having to watch a pot on the stovetop to keep the soup from burning or boiling over. I often keep the soup simmering on low for a couple of hours, let it go automatically to warm for a couple more, and then keep switching until I'm ready to refrigerate the soup after eating. These are my best helpers in making soup. Why not treat yourself to one you don't have? When I took a walk this week, I did a double take when I passed the yard where this tree lives. I had never noticed the lemon tree there before. As you can see, it's grown quite high. This is no dwarf in a half wine barrel that can be moved to a warm spot when it's cold. My husband found ice on his windshield one morning of the week I passed this tree. All the experts told me citrus would not grow here in Paso Robles. This is not the first tree I've seen that proved them wrong. 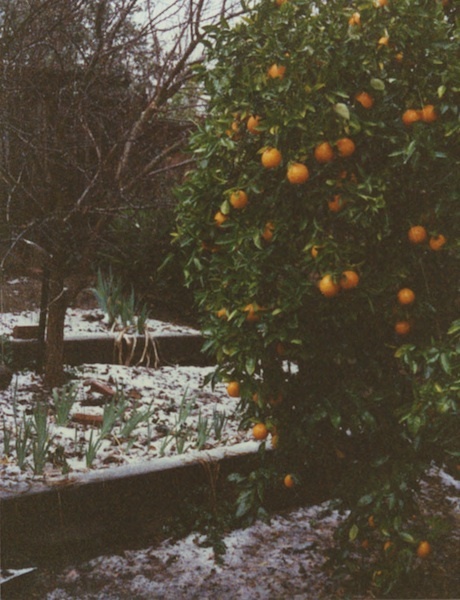 We had a very productive nature navel orange tree at our Newbury Park house in Southern California before we moved here. 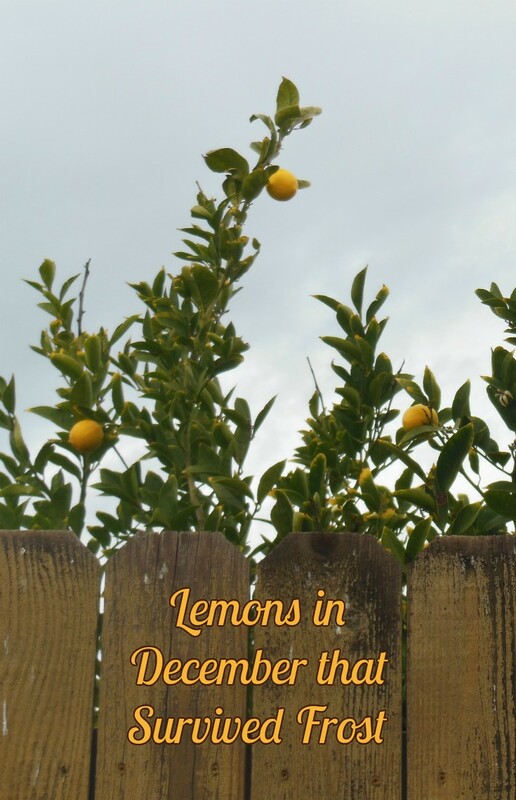 The climate was perfect for citrus and everyone had citrus trees in their yards. 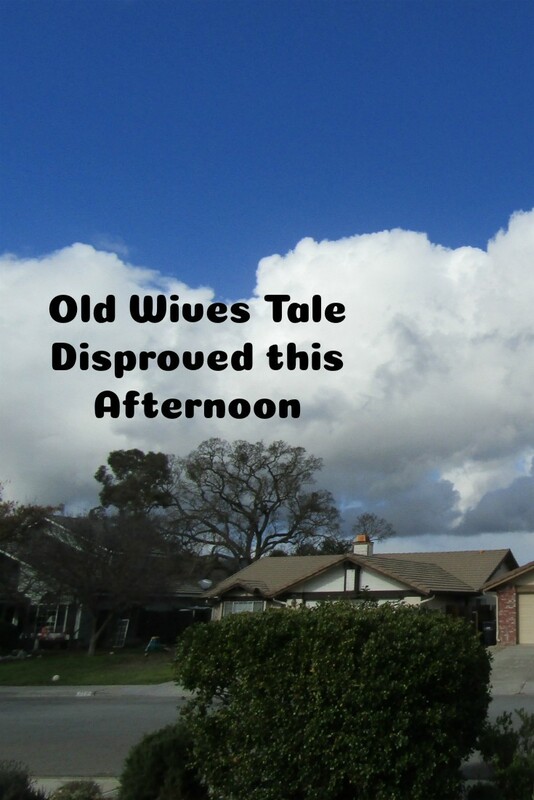 The climate was just right -- except the day it snowed. It snows in Newbury Park about once every twenty years. The tree survived with no help from us. I guess an occasional really cold day or night won't kill a tree. I'll be keeping an eye on that lemon tree if we have a really cold spell with freezing temperatures for several nights in a row. I hope this beautiful tree lives a long and productive life. May its owners enjoy lemons for years to come. 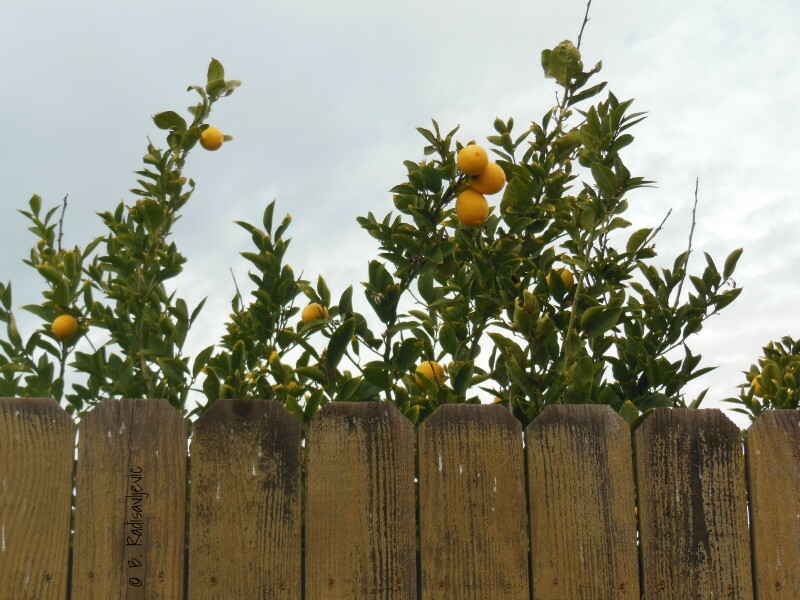 Do you have a citrus tree in your yard? Is your climate favorable to its growth? 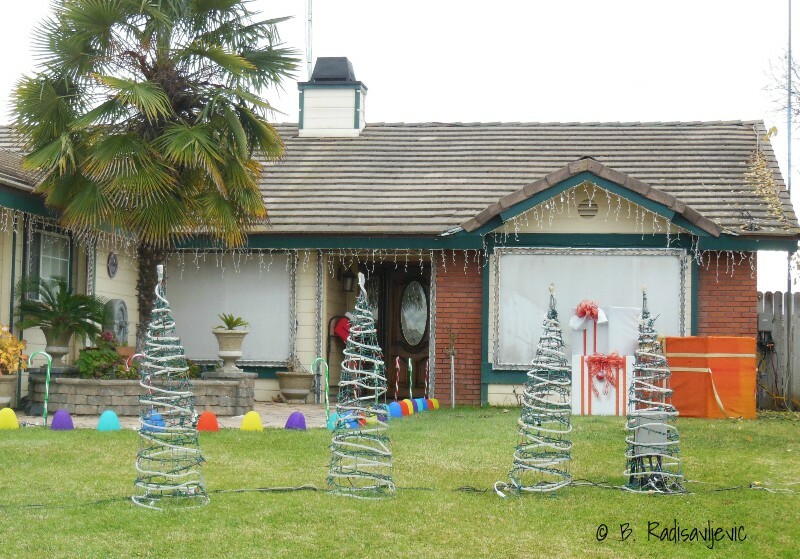 Christmas decorations are going up all over the neighborhood now. The Cullen Family always puts on a spectacular display with lights, moving objects, and sound. Today I walked by a little after noon and took a few pictures. The display was not completely set up yet. 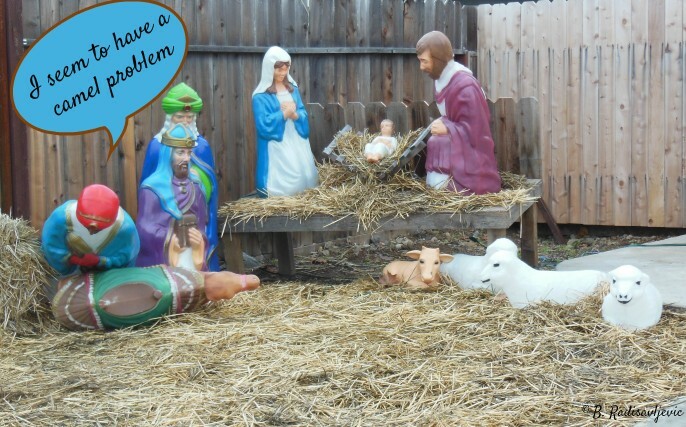 I happened to notice the nativity set, but there seems to be a problem with the wise man and his camel. They appear to be down. I couldn't help but wonder what happened here. A roaming neighborhood dog? A child? I didn't notice much wind, but we did have some rain this week. Curious minds want to know how this happened. Here's another daytime view of the set-up. This display changes every year as the family adds more to it. Here's how it looked in 2010 when I made this video. Here is a more professional version from 2009 produced by the Cullen family who created this display. Things are arranged a bit differently this year, and I anticipate seeing how it all comes together. Stay tuned. For your Wordless Wednesday enjoyment. 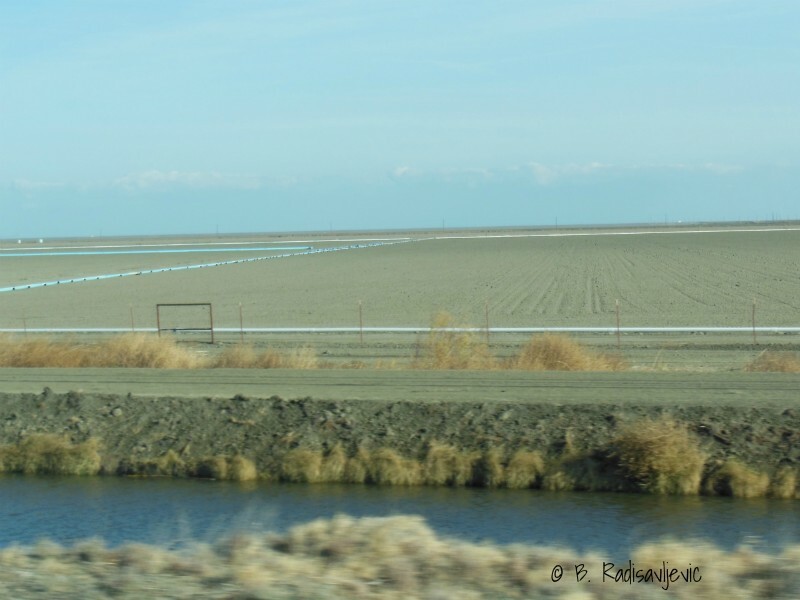 On a recent trip to Madera, we saw firsthand the transition the California drought has brought to what once was prime agricultural land. 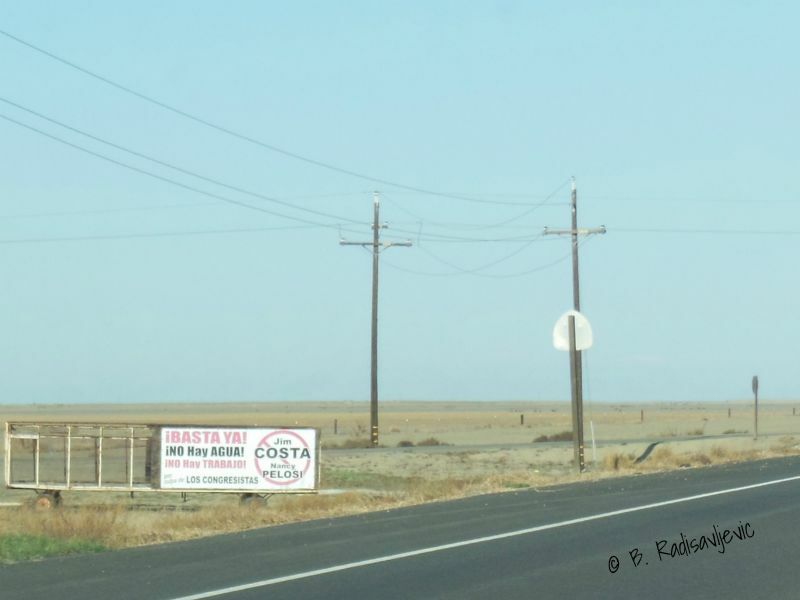 As we approached Highway 198 on Highway 41, through the agricultural area, we saw signs like this in English and Spanish in front of dry and barren fields. Many years ago when we passed they were green. That was before the drought and the water crisis. Rough Translation of Sign into English: Enough is enough. There's no water. There are no jobs. It's the fault of Congresspeople Jim Costa and Nancy Pelosi. I saw another sign but I wasn't quick enough to photograph before we passed it. That sign said something like this. That sign was on the west side of the highway. Here's what was on the east side. 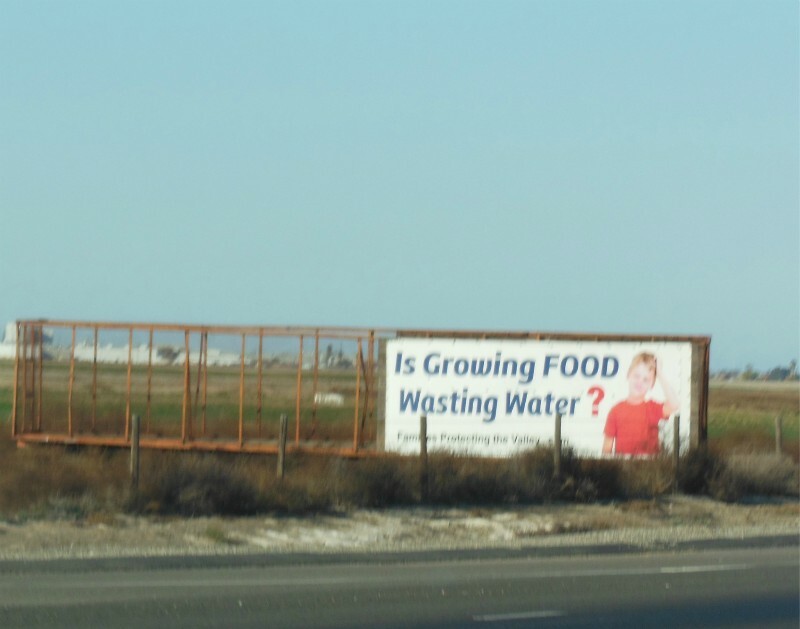 It made me wonder why some farmers get water and some don't. Do some have more political pull than others? I don't know, but I did wonder. 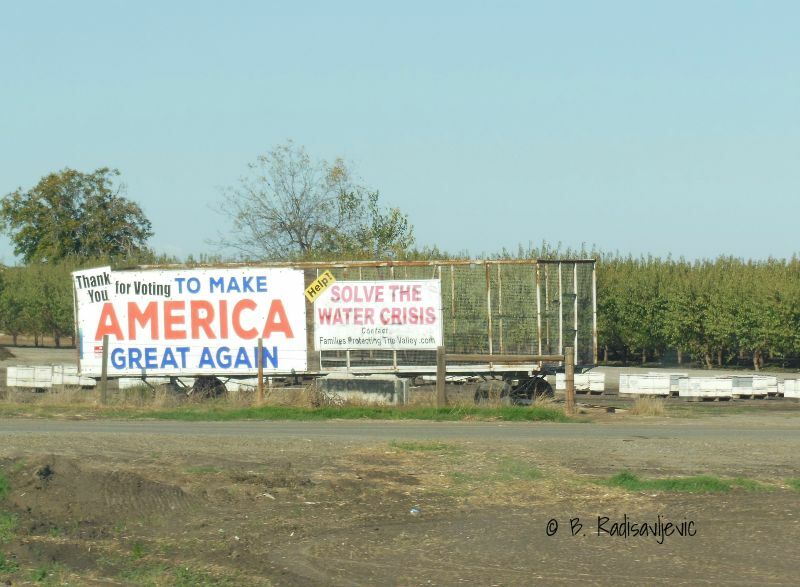 The congressman for this area, Devin Nunes, had much to say about the politics involved, in his blog posts on the water crisis. Fourth District Congressman Tom McClintock also had a lot to say about the politics of the water crisis. 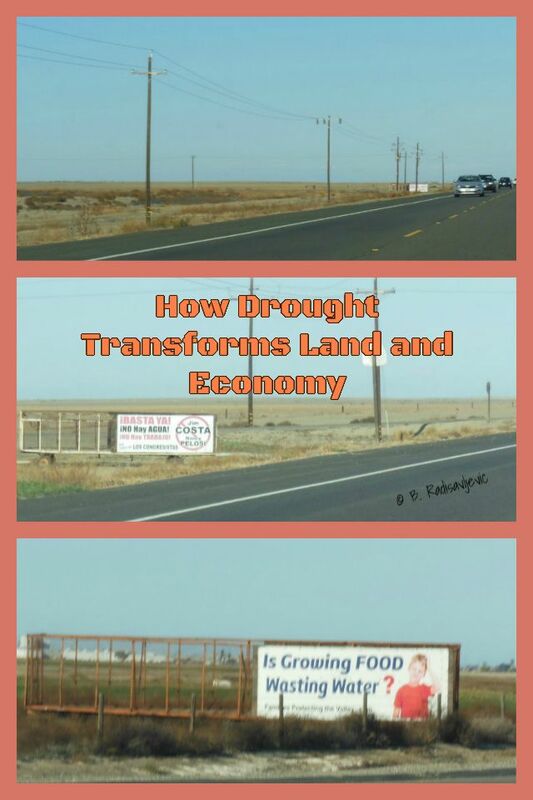 When farmers don't get water, they don't grow our food. They can't do it without water. I took this photo just a bit farther down the highway. Some farmers do have water, but not others. Evidently, some politicians think so. Most of the signs we saw were placed by an organization called Families Protecting the Valley. Their website explains some of the policies that they believe are influencing who gets to use the water. 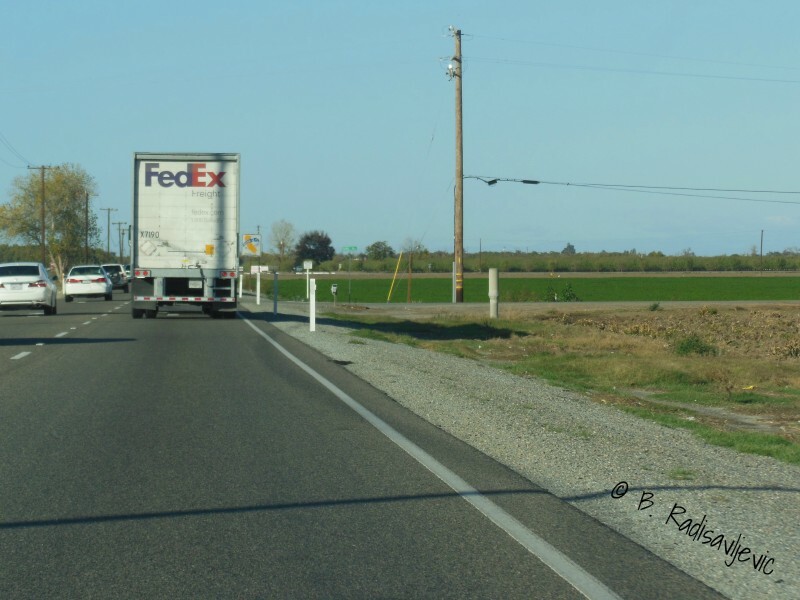 They point out that historically the San Joaquin Valley has been one of the world's primary growing areas. It is important in our country's ability to be food independent. As you might guess, since the water crisis, many people have lost their jobs, since farmers with no water can't employ them. 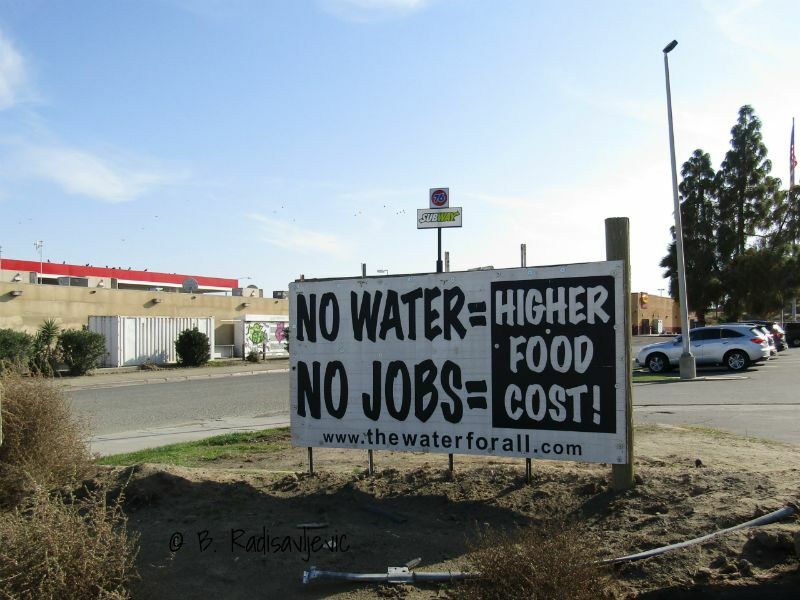 We saw this sign behind the Carl's Jr. parking lot near the intersection of Interstate Highway 5 and Highway 41. This is near the busiest intersection we passed on our way to Madera, and there were many places to buy food clustered here. I could not find the website address written on the sign. It seems to have been temporary since the domain is now for sale. One of the last signs we saw on the way home was this. It's obvious who these farmers believe will help them. I hope they are right. This post was written for City Daily Photo Bloggers Theme Day. 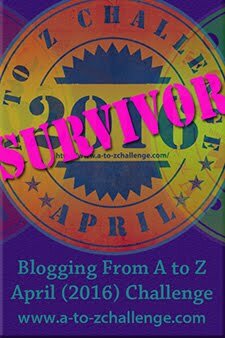 This month's theme is "Transitions." I have personally seen the transition of green fields and even trees to brown ones when there is not enough rain. 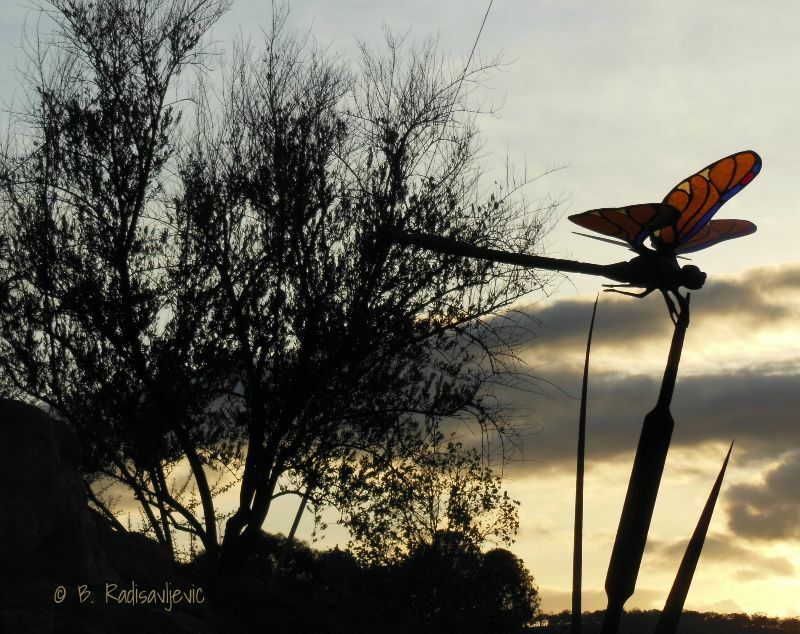 See what photos other City Daily Photo Bloggers have posted to illustrate this theme.